It’s a shame to see trees planted improperly and/or not given good care after planting. Unfortunately, it happens a lot. Staking trees at planting time in home landscapes and on commercial plantings is an industry paradigm, although a bad one. In some rare cases, staking is needed to protect young trees from vandalism and accidental physical injury, but staking is mostly done to allegedly protect trees from falling over in the wind or to support trees that aren’t strong enough to stand up straight by themselves. In the past, tree staking was believed to be important in helping a tree become established. However, over the last 20 years, research has indicated strongly that staking hurts a tree more than it helps. I have been saying this for about 40 years now and have never allowed tress to be staked on my landscape projects. Staked trees, especially when improperly staked, develop smaller root systems and thinner trunks than trees that aren’t staked. The movement of the tree trunk in the wind is a good thing. It stimulates plant hormones that influence root and trunk growth. Trees staked in a way that prevents movement of the trunk don’t grow as well. This is why young trees that are staked are often unable to stand upright when the staking is removed. Staking connectors to the trunks usually cause damage to the trunks, even if soft material is used. The constant banging of ropes, hoses, straps, etc. may not appear to be doing physical damage, but the cambium layer is being crushed and damaged. Sometimes the damage is obvious and severe. The solution is simple. Don’t stake trees unless absolutely necessary. Staking should be the exception rather than the rule. Trees less than six feet tall or trees less than one inch in diameter don’t ever need support staking. Staking may be needed with larger trees, especially when the top of tree is out of proportion to the root ball or when the tree is planted in a windy site or on sandy soil. If trees are weak or out of proportion, they shouldn’t have been planted in the first place. When a tree must be staked, use one of the newer systems that allow the trunk to move with the winds. The old standard of wire or plastic twine inside pieces of garden hose is one of the worst choices, but any system that holds the tree rigidly in place is bad. 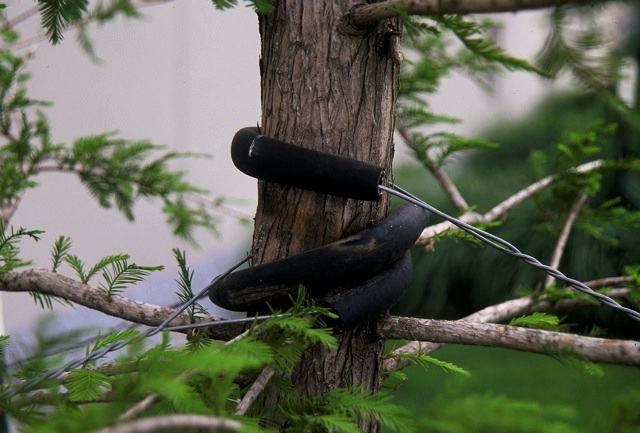 Don’t ever use rope, twine, wire, fishing line or electrical wire to secure a tree to stakes. Use soft materials like wide cloth belting, elastic webbing, wide rubber belts, plastic bag material or even nylon stockings. 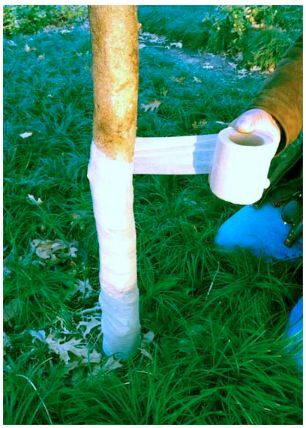 There are a number of elastic or polyethylene woven ties now available for securing trees to stakes. If used, ties should be left with sufficient slack to enable the tree to move slightly in the wind. Remove the staking as soon as the tree’s roots begin to grow. They should never be allowed to remain more than the first growing season. If the tree can’t hold itself straight after the first season, it never will. For many years, some arborists and horticulturists have recommended protecting young tree trunks with commercially available trunk wraps. These wraps were believed to protect the tree from physical injury, from frost cracking and sunscald that results from drastic temperature fluctuations, from borer and other insect attacks and from dying out. It was a mistake. Research indicates that tree wraps hurt trees rather than protect them. Paper wraps hold in moisture and lead to problems with diseases, insects and freeze injury. Severe temperature changes have been found to occur beneath the wraps. Most competent arborists and horticulturist agree with this and don’t use this destructive and money wasting procedure. There are a number of materials that have been used to wrap trunks. They are all bad. Home gardeners have made some of their own wraps out of various materials such as burlap or duct tape. Like staking ties, these materials have also caused harm to trees by damaging bark and cambium layers, restricting growth and/or girdling trunks. If tree trunk protection is needed against sunscald on thin barked trees, such as ash, birch, linden or maple, there is a much better way to go. White washing trunks is much better than trunk wrap. White latex paint that is diluted with water to about a 50 – 50 mix works well. Doing this same process with paint about the color of the trunk is even better. This ARS tested and approved method is effective at repelling insect pests as well as preventing sunburn. There’s one situation where wrapping trunks might make sense. If the trunk of a tree has been physically damaged, painting the injured area with Tree Trunk Goop formula and then wrapping the damaged area with burlap soaked in Tree Trunk Goop will help the tree’s wounds heal much faster. The burlap helps hold the material in place as it protects and feeds the tree. An old and extremely damaging tree staking technique.